Start by assessing the future needs of users and forecasting demand. Then, identify and evaluate the different project options, using a whole life-cycle analysis. Finally, prioritize and select the option that offers the best socio-economic benefit-to-cost ratio. This assessment will establish exactly how the infrastructure asset, in its current form, falls short of users’ present and future needs. Analyse diligently the asset’s current performance and capacity in order to identify the problems and constraints – before committing to across-the-board measures. Conduct a user survey to clarify the future requirements, and avoid assuming that needs are already clear in advance. Assess the various options – specifically, improving, expanding or replacing the existing system – as outlined in the following order and as illustrated in Figure 25. Manage demand through new pricing models, such as the peak pricing used in many electricity markets or the congestion charges applied in various cities around the world. Consider as well other idle system capacity in space or mode. Increase throughput by means of new technologies, such as automated highway tolling or next-generation air traffic control systems. Alternatively, reduce losses in the case of utilities; for example, water systems can be optimized economically by reducing leakage and theft rather than by building new supply lines or treatment plants. Make a targeted investment to debottleneck the system. This applies to port terminals, for example, that require systemwide coordination, from sea-side (berth allocation for vessels) to yard-side (yard space allocation) and land-side (truck gate management). If new construction is needed, opt for expanding a current facility if possible (e.g. a new runway at an existing airport), rather than creating a new facility on a greenfield site. The former option will enable economies of scale in operations and better connectivity, whereas the latter option could result in fragmentation. Undertake greenfield development as a last resort. Before taking the decision, ensure that the following criteria are met: current system capacity is fully and efficiently used; rehabilitation of the current facility would be too costly because of serious structural deficiencies; an expansion of the current facility, owing to design or space constraints, is unable to meet the expected demand or changing requirements of users; and cheaper alternative modes or system designs are unfeasible. Conduct a whole life-cycle cost-benefit analysis for each alternative. Once the different project alternatives have been identified, evaluate each by conducting a whole life-cycle cost-benefit analysis, which should consider: all associated costs from cradle to grave, as well as the various benefits including direct user benefits; the environmental impacts (air, water and noise pollution, climate change, resource depletion, land and forest degradation); social effects (e.g. on education, health, safety, cultural diversity); and economic effects (e.g. on GDP, employment, property values, taxes). Sources: Prieto, B.: Application of Life Cycle Analysis in the Capital Assets Industry. In PM World Today, 2012; Long-Life Concrete Pavements in Europe and Canada, 2007. US Federal Highway Administration. The New Paving Realities: The Impact of Asphalt Cost Escalator Clauses on State Finances, 2012. Portland: Portland Cement Association. In many cases, the life cycle analysis will reveal that the long-term costs of O&M are actually much greater than the initial costs of construction. 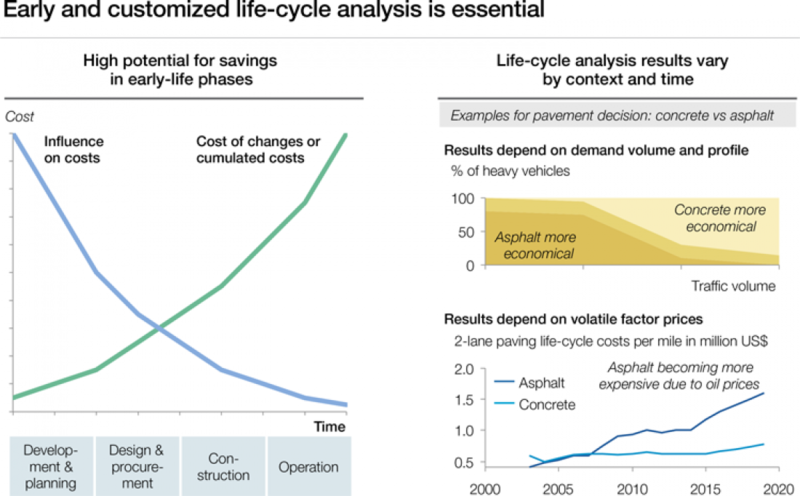 The life cycle cost analysis thus needs to be performed early on, as the majority of life cycle costs can still be influenced at that time through shrewd design and engineering decisions. Later on, that influence diminishes, and the cost of changes increases (Figure 26). In the life cycle analysis, the trade-off between opex and capex should be explicitly modelled, and any smart solutions that might reduce whole life-cycle costs should be considered. Previous designs and construction techniques were not always conducive to O&M. Thus, for rehabilitation and reconstruction projects (as for new construction projects), adopt a life cycle orientation when making decisions on design and procurement – “purchasing not the cheapest but the best in the long run”. In addition, leverage the results of the life cycle analysis to plan and secure the budget for later O&M expenses. Prioritize and rank the projects within the portfolio, and develop the project pipeline. Rank projects according to their socio-economic benefit-to-cost ratio, and screen out any that do not add value. Identify and highlight trade-offs that are inherently difficult to quantify – for example, environmental impact versus financial costs. 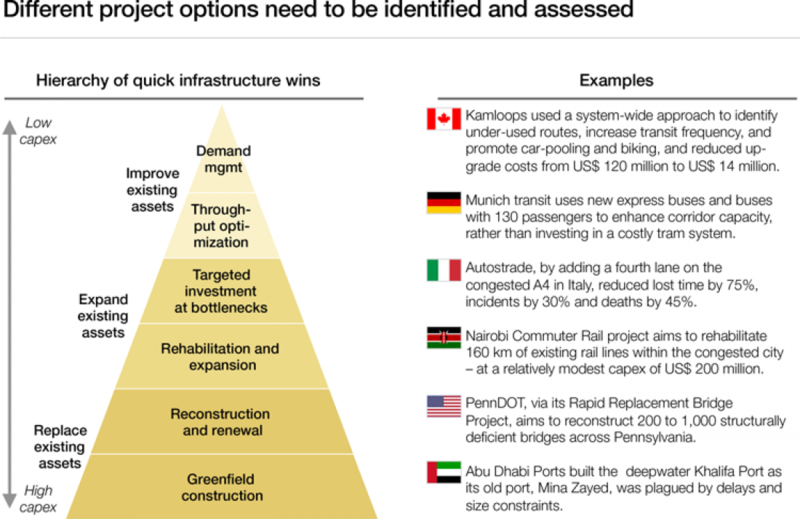 Embed projects in the context of the broader strategic infrastructure plan. Across projects, assess both cost-side synergies (enabled by the synchronizing of procurement and construction schedules) and demand-side synergies (based on interdependencies of a network’s assets). Decide on ideal timing, not just for the start of the project but also for the build-out – specifically, whether to follow a steady, incremental development or to take a “batch” approach. Consider the full array of procurement and contracting options. In Romania, the upgrade of Bucharest municipality’s water and sanitation system was assigned to a concessionaire, which invested US$ 210 million in modernizing services and built a new water treatment plant. Water losses declined by 44% after leaks were fixed and a new metering system was introduced, and customer satisfaction has increased dramatically.154 The case study on the hospital PPP in Tlalnepantla, Mexico provides another example (Box 6). Conduct a rigorous value-for-money analysis. 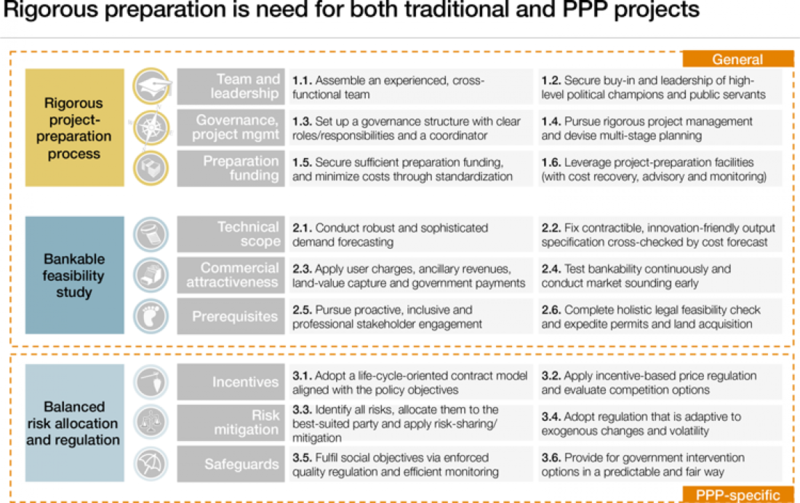 PPPs will not always provide best value for money (VfM). To choose the most promising delivery and financing mode, governments should create a public-sector comparator (PSC) that estimates the whole life cost of carrying out the project under the traditional standard government delivery model. Then, they should estimate the whole life costs of the alternative PPP approach, and compare them against the PSC. A PPP is considered VfM only if it entails a net positive economic gain relative to the PSC. Consider both costs and benefits of all the rival delivery modes. Include all types of costs, not only the evident costs for investment, O&M and financing, but also those related to the transaction and oversight of the contract. Make sure to compare “like with like” when assessing the non-financial benefits of various modes, such as the potential of a PPP for accelerated and higher-quality project delivery. Analyse and evaluate the risks, which will help to correct distortions; risks are typically not budgeted under public procurement. To place a value on each risk, multiply the projected cost of resolving the problem (in the event that the risk is realized) by its estimated likelihood. Make any other adjustments that might be necessary for competitive neutrality; for example, factor in the different tax treatments that the various options would be subject to. Adopt clear guidelines to improve quality and consistency. For instance, UK policy is to use standardized Excel tools and guidelines, specify discount-rate assumptions, and estimate risk values on the basis of past projects. To check the robustness of the base-case analysis, use sensitivity testing and scenario analysis to challenge the underlying assumptions and their impact on the VfM results. Supplement the quantitative analysis with qualitative expert assessments on whether it is in the public interest to deliver core services by the private sector. For example, in the UK, qualitative reviews are conducted on three aspects: viability, desirability and achievability. Take a multistage approach, and repeat it at various times. For example, Australian policy is to conduct a VfM analysis before issuing the request for proposals, but then to reassess the alternative delivery modes at later stages of the project, such as after submission of the bids. In 2010, a new hospital was commissioned in Tlalnepantla to replace the old hospital, which was no longer able to satisfy the medical needs of the local population. The new hospital was delivered as a 25-year PPP, with a consortium led by Grupo Marhnos, responsible for design, financing, construction and maintenance, as well as different services including cleaning, logistics, waste disposal and diagnostics. The contract has a pay-for-performance structure: the government stipulates outcome-based quality metrics and targets (which are checked by a government supervisor), and the contractor’s payment is adjusted according to its results. This enables the contractor to retain the entrepreneurial freedom to make innovative decisions incorporating whole life-cycle assessments. For example, after making a calculated trade-off of capex and opex in the design and engineering phase, the contractors opted for a mainly metallic rather than concrete structure, as it entails lower maintenance costs over the hospital’s lifespan. They also have a strategic framework agreement with key suppliers of medical equipment, yielding lower prices based on the volume across multiple hospital sites. Overall, the PPP has accomplished whole life-cycle savings of 30% relative to the projected costs of traditional public delivery. It has also produced a “greener” social infrastructure, with energy savings estimated at 20%. Above all, the new hospital is providing the local patient population – 6,000 inpatients and 20,000 outpatients annually – with enhanced medical outcomes. Avoid over-engineering in design. Specifically, be frugal and adapt to (and perhaps adapt) customer needs; question the performance specifications, and deliver only what the customer really wants. For example, for the Tyrrhenian toll-road project, Autostrade per l’Italia managed to reduce the projected capital expenditure from € 3.6 billion to just € 2.0 billion by lowering the maximum speed and thereby saving on expensive tunnels and bridges. A railway project might similarly achieve huge savings by opting for a medium-speed rather than a high-speed rail line: that would be particularly feasible for short-distance lines, where reliable and economical travel may be more important than slightly shorter journey times. Develop systems that fulfil customer needs at the lowest possible life cycle cost – for example, by developing and adopting modular or standardized designs that can be repeated across projects; homogenizing processes, equipment and material; and leveraging learning and scale effects. Design for longevity. The private concessionaire of the world’s tallest bridge, the Millau Viaduct in France, has guaranteed that it will remain operational for at least 120 years. Design for flexibility. User needs evolve; ports, for instance, might need to accommodate larger container ships. So ideally, the asset should have built-in, long-term adaptability from the outset. Heathrow Airport’s Terminal 5, for example, employed modular designs so the gates could be equally usable for both low-cost and hub carriers. Leighton Contractors, for its South East Queensland Schools PPP, made the school facilities future-proof for the 30-year concession by planning three stages of construction, with progression to the next stage based on increasing student numbers. When school enrolments accelerated beyond the original forecast, one facility was redesigned to accommodate 30% more students than planned. Optimize construction management and monitoring. Set up a project management office for systematically monitoring and supporting project teams and contractors in their efforts to avoid slippages in cost and schedule. Define clear roles and interfaces to improve coordination of the different parties involved. Define and implement lean methodology in construction and the supply chain to avoid waste, such as waiting times for materials and equipment, unnecessary movements and rework. Establish a rigorous and forward-looking system of cost-, risk- and time management. Use innovative technologies. For rebuilding roads, for instance, this could involve modern and specialized asphalt systems or concretes, prefabricated components and recycled materials. Procure any equipment and components based on the best VfM, taking a whole life-cycle perspective and considering both cost and quality. Consider innovation-friendly output/outcome specifications; use input specifications sparingly: every additional input specification limits design options, and so could increase costs. Scope procurement documents diligently, and freeze the project specifications before putting the project out for tender, to avoid costly changes later. Design contracts with clear liability rules and bonus-malus incentives. 148 London Assembly. London’s water supply. October, 2003. A report by the London Assembly’s Public Services Committee. 149 “Investitionen in Infrastruktur: Löwenanteil für die Bildung”. Handelsblatt, http://www.handelsblatt.com/politik/deutschland/investitionen-in-infrastruktur-loewenanteil-fuer-die-bildung-seite-all/3086874-all.html, 2009. 150 Sirkin, H. L. “U.S. Airport Capacity: Failure to Launch”. Businessweek, July 06, 2012. http://www.businessweek.com/articles/2012-07-06/fear-of-flying. 151 For more information on best practices in demand forecasting, see chapter 2.1 of the report Strategic Infrastructure: Steps to Prepare and Accelerate Public-Private Partnerships. World Economic Forum, 2013. 152 The Nordic State Road and Railway Infrastructure Market. Research Reports of the Finnish Transport Agency. 2013. Helsinki: Finnish Transport Agency. 153 IFC Support to Transport. Highlights of Advisory and Investment Work in the Airlines, Airports, Ports, Roads, Urban Transit & Rail, and Warehouse & Logistics Sectors. 2010. International Finance Corporation (IFC). 154 “IFC Support to Infrastructure”. IFC, http://www1.ifc.org/wps/wcm/connect/62aa5680498390a982c4d2336b93d75f/InfrastructureBooklet_FINALweb.pdf?MOD=AJPERES&CACHEID=62aa5680498390a982c4d2336b93d75f, 2009. 155 Value for Money. State of the Practice. December 2011. U.S. Department of Transportation. Federal Highway Administration. 156 Success Stories Public-Private Partnerships. Mexico: Toluca and Tlalnepantla Hospitals. 2011. Washington DC: International Finance Corporation. 157 Strategic Infrastructure: Steps to Prepare and Accelerate Public-Private Partnerships. 2013. World Economic Forum. 158 Eight Key Levers for Effective Large-Capex-Project Management: Introducing the BCG LPM Octagon. The Boston Consulting Group, 2012. 159 Cardno, C. “Group Seeks Sustainable, Integrated Water Projects”. The American Society of Civil Engineers, 2013. http://www.asce.org/CEMagazine/ArticleNs.aspx?id=23622323172#.Ua9S7Ngw8-N.